Bureaucracy has it’s own language; Bureaucratese. Over the course of my lifetime, I have learned to translate it on the fly – but apparently this skill is one very few have. In this entry, I will cover a few different words and what they actually mean. This post will be updated as I things jar my memory. Acronyms: The more acronyms associated with a bureaucracy, the more inefficient it is. This complexity also leads to potential corruption. Analysis: A means of finding meaning from metrics or data which may or may not be appropriate depending on the context of the metrics and/or data, as well as what the actual point is. Bureaucrat: Someone who takes exception to these definitions. Typically someone who has drank the Kool-Aid and is trying to be a distributor. Capacity: The potential to do something. Unless this word is associated with a concrete way to measure things (see ‘Metric’), it’s a useless word that communicates the hopes and dreams of the Stakeholder writing it. They might want Funding. Committee: A group of legal entities, perhaps even Stakeholders, that attempts to do something of worth. It involves meetings, agendas, and all manner of documentation. Data: A generic term that may or may not involve metrics; metric that comes from forms, as an example, may or may not be useful based on the questions asked and the audience. Diversity: Diverse, but having little or no conflict that needs to be resolved by people who are actual stakeholders but have no actual say in a committee or group. Documentation: Something that rarely reflects the reality of a situation in a bureaucracy. e'<insert word here>’: A 1990s methodology of trying to bring the word ‘electronic’ to bear on matters that are about technology implementation of the word used. 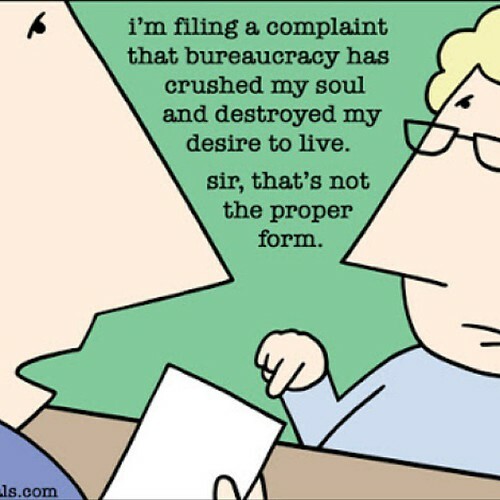 For example, ‘eBureaucracy’ would be about using technology to implement Bureaucracy. eBusiness: What the rest of the world calls business. eDemocracy: There’s really no such thing. It’s either a democratic process or not. eGovernance: A reference to policies and processes that the bureaucracies wants to create to make their jobs easier. They usually create committees and have multi-stakeholder approaches to doing this (see associated definitions). Funding: Money necessary to create more bureaucracy while making sure people who are creating the bureaucracy continue to get paid. Human Capacity: A reference to people who do concrete things. ICT: What the rest of the world calls ‘IT’. It stands for Information Communication Technology and assures correspondence has a character that makes people believe that it is somehow different to the popular use of “Information Technology” -‘IT’. Leverage: A poor reference to physics; the idea is that a small amount of energy can be used to do great things with a lever. When the word ‘leverage’ is used, it’s usually associated with a notion that something will be done. This word, especially when used with ‘Synergy’, typically means you can ignore the sentence since they’re discussing hopes and dreams. Hopes and dreams have a purpose, but in bureaucratese, they are tongue in cheek since bureaucracy chokes hopes and dreams with red tape. Metric: A way of measuring things; this can be useful if the appropriate things are measured and are simply fluff if the inappropriate things are measured. This word is typically used with the word ‘Analysis’ wandering around somewhere nearby, and thus bears scrutiny to assure that the appropriate things are being measured in the first place. Multi-stakeholder: See ‘Stakeholder‘. When this word is used, it refers to a mix of stakeholders. Stakeholder bias, the bias implicit in the types of stakeholders involved (such as companies alone) is masked by the use of this word. Synergy: This used to be a really impressive word that implied collaboration or integration of some sort. Now it’s sort of an empty word, where you can ignore the sentence it is in – especially if the sentence includes ‘Leverage’. Stakeholder: A legal entity that is involved. The casual reader might think this refers to people – and sometimes it might include people. It is used in various ways in various dialects of Bureaucratese, but typically it means any legal entities involved – from a government organization to a non-government organization, to a business, to a actual human being. When the word is used, make sure that who the stakeholder is is communicated, and why they are a stakeholder. The reason of why they are a stakeholder is typically associated with what sort of legal entity they are. A company will try to be more profitable, a government organization might wish to have more control over citizens, a non-profit might give you a nice warm and fuzzy intention underneath there is the need to get the next round of funding. Actual humans will typically be interested in opposing at least some of all of that. If there are no humans as stakeholders, members of society, then that tells you a lot. Strategy: Typically a methodology of using bureaucracy to create more bureaucracy, typically an unconscious bait-and-switch while saying that the bureaucracy will be accomplishing other tasks. This almost always entails the need for Funding, as well as the creation of new Acronyms. Did I miss something? Is there a word confusing you? Drop a comment and I’ll help you clear it up.